When Will LEDs Replace Office Fluorescents? Philips claims a breakthrough in LED efficacy that accelerates the timetable in which LEDs will eclipse fluorescents in workplaces worldwide. The lighting giant, and sponsor of this site, has achieved an efficacy of 200 lumen per watt in a 2700K fluorescent replacement tube. The company announced last week that it expects products based on this achievement to hit the market in 2015 -- a year ahead of the Department of Energy's projection for when this milestone would be achieved in commercial products. Just yesterday, we featured a case study of a fluorescent replacement project in a manufacturing environment, a sidelight of which was the company's choice not to replace fluorescents in office areas with LEDs, but rather to update the fluorescents to more efficient models of the same. This scenario has been playing out in offices everywhere, as LED penetration has grown in home, industrial, restaurant, and museum applications over the last several years. The office is tough, because fluorescents are economical, already boast decent efficiency, and have good functionality (such as available dimmability). In many office environments, changing fluorescent bulbs isn't a major operation, as it tends to be in high-bay manufacturing space. So the shorter lifespan of fluorescents does not impose a large maintenance penalty when compared to LEDs. For these reasons, "The cost savings are not as clear there," as Bluestone Energy's Sean Fuller told me for the case study. Recently, the Pacific Northwest National Laboratory released the results of a study comparing recessed troffer fluorescent lighting with several forms of LED alternatives and replacements. (Here is the 60-page PDF; Illumination in Focus has a summary of the results.) The study shows improvement on the LED side of the ledger, since similar research carried out the year before, but overall, the results do not present a clear-cut win for LEDs. The study was carried out with products purchased in June and July of 2012. The tested LED lights had an average efficacy of 80.3 lm/W, contrasting with an average of 59.6 lm/W for the fluorescents. But the LEDs demonstrated, to a panel of lighting designers and other experts, more problems than the older technology. In particular, the retrofit LED-based tubes tended to have the most issues with output uniformity, light quality, color quality, and glare (as well as lingering safety concerns). But an efficacy of 200 lm/W alters the picture significantly. 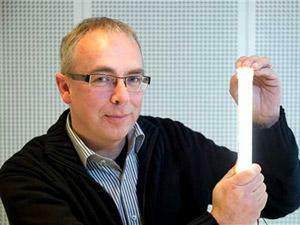 Rene van Schooten, CEO of Light Sources & Electronics for Philips Lighting, believes that 10 years will be time enough for LEDs to replace half of the world's fluorescent bulbs, according to an AP story. The AP also gets an opinion from Philips competitor Acuity's Mark Hand, who notes that the best fluorescents now on the market feature an efficacy of about 100 lm/W; he believes that fluorescents may eventually achieve 120 lm/W. Hand thinks the 10-year figure is pessimistic, and that LEDs will surpass 50 percent penetration "certainly within five years, maybe within three." What do you think -- when will the crossover point occur?